Few players wish injury on another but Jake Ball has an opportunity to step up and make the most of others’ misfortunes, according to England teammate Jos Buttler. Buttler, Ball and co get their Royal London One-Day International Series with Australia underway this week, with the first of their five 50-over matches taking place at The Oval on Wednesday. But they’ll do so without talismanic all-rounders Ben Stokes and Chris Woakes, ruled out with injury as Eoin Morgan prepares to delve into their vast fast bowling reserves. Nottinghamshire’s Ball is among those vying to be the next cab off the rank too, despite only playing in one match in England’s 4-1 victory over the same opposition earlier this year. The 27-year-old has yet to hit the heights of his ODI debut where five wickets came his way for the first, and so far only time, against Bangladesh, but Buttler believes he’s in the perfect place to step up for his country. “Someone like Jake Ball will see it as a chance to really make his mark on the team,” said the wicket-keeper, speaking at a private batting session to celebrate unconventional greatness in cricket with Royal London. “That competition within the side is something that has improved the team and people are desperate to take opportunities. “We’ve got so much confidence in the guys coming in. Jake opened the bowling in the Champions Trophy last year and performed brilliantly. “Tom Curran came into the side in Australia and put in a man of the match performance with a five-wicket haul in Perth to win us the game. With no shortage of talent vying for England places, Ball has felt the effects from both sides – struggling to nail down a place in either the Test or ODI teams. Yet his influence has helped his country to become the world’s No.1 team – despite a humbling defeat to associate nation Scotland as recently as Sunday. 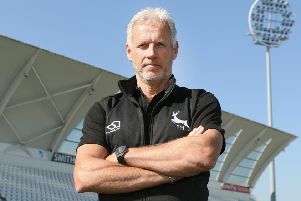 The Worksop quick wasn’t involved in that particular outing but a second bite of the cherry could come his way sooner rather than later after being added to the squad in place of Woakes. And wicket-keeper Buttler is confident it is those names behind the first-choice XI that could determine England’s World Cup path in 12 months’ time. “Ben and Chris are fantastic cricketers that give you all three elements of bat, ball and field, so of course they will be missed,” he added. “But what has been really good in improving the side over the past few years is that competition for places within the squad. “People outside the team are really pushing for a place in the team and ready to step up. It’s unfortunate for those guys to be missing out but it presents great opportunities for other guys to step in, perform and push their case for a regular spot. • Royal London, proud sponsors of one-day cricket, is celebrating unconventional greatness in the game by championing the independent spirt of players and fans.